The University of New Brunswick is launching a new interdisciplinary speakers series called Conversations on Time. Each speaker of this three-part series will examine the theme of time through the lens of their academic field to engage participants in an interdisciplinary dialogue. 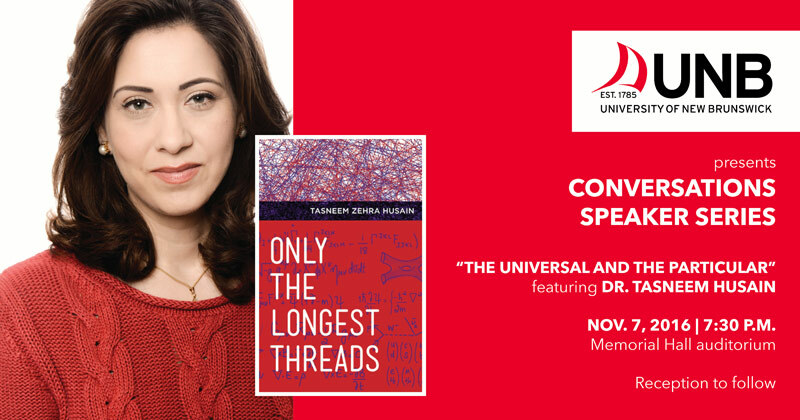 The first Conversations on Time event, entitled “The Universal and the Particular,” will feature Dr. Tasneem Husain on Nov. 7 at 7:30 p.m., at Memorial Hall on the UNB Fredericton campus. Tasneem Husain is a theoretical physicist, writer and educator. She has written numerous articles for newspapers and magazines, both in print and online, has contributed to anthologies of science writing for adults and children, and is a regular columnist for the award-winning blog, 3quarksdaily.com. She teaches writing at the Cambridge Center for Adult Education in Cambridge, Mass. and has conducted science writing workshops around the world, most recently at CERN, the European Organization for Nuclear Research. She will discuss how scientists and writers treat the subject of time. She will explore a range of writings from Albert Einstein to Alan Lightman, from Sean Carroll to James Gleick, with certain universal themes emerging across the spectrum. She will identify the particular, personal touches that each writer leaves on their work. The Conversations on Time series will feature two additional speakers in early 2017: Dr. Steven Turner, UNB professor emeritus in history, whose research has included the history of German universities and history of various scientific controversies over the physiology and psychology of vision; Dr. Ellen Rose of the UNB faculty of education. Her research interests include e-learning, the social and cultural implications of media and technology, new paradigms in instructional design, and cultural studies and critical theory. The Conversations series is free and open to all members of the UNB community and the public. The first of the series is being presented by the departments of English and mathematics and statistics along with the faculty of science and Renaissance College.